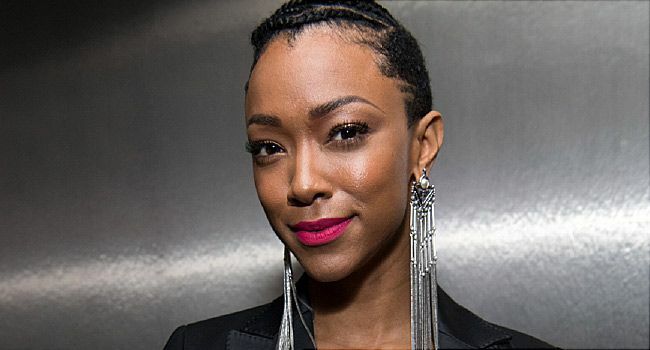 Sonequa Martin-Green says that her mother has always been the strongest woman she knows. Martin successfully overcame colon cancer, but more cancer was in the family’s future. In 2010, she was diagnosed with breast cancer, and it seemed that no sooner had she beaten that form of the disease, it returned in the form of a slow-growing stomach cancer, diagnosed in 2013. The nonprofit Stand Up To Cancer (SU2C) funds cancer research across institutions and disciplines, encouraging collaboration rather than competition to help accelerate the pace of scientific breakthroughs. Martin-Green first joined forces with the organization in 2016 at a New Orleans event for its Innovative Research Grants, which fund cancer research that might not receive support through more traditional avenues. Since then, she has participated in SU2C’s biennial TV fundraisers, and in early 2018, she taped “Stand Up for Us All,” a public service announcement designed to raise people’s awareness about the importance of participation in clinical trials. By the time the third cancer diagnosis came, in 2013, Martin-Green was determined that she would be as involved with her mother’s care as possible. “I was crowding!” she laughs. At that point she had been cast in her breakout role as Sasha Williams in The Walking Dead and was filming nearby in Atlanta. Martin-Green is very mindful of the legacy she carries with her Star Trek role. As Starfleet officer Michael Burnham, she is the first woman of color to lead a Star Trek series, and one of only a handful of black female leads in sci-fi/fantasy television to date. The original Star Trek, which aired for three seasons in the 1960s, was one of the most racially integrated series of its time, with two actors of color -- African-American actor Nichelle Nichols as Nyota Uhura and Asian-American actor George Takei as Hikaru Sulu -- in leading roles as respected officers of the starship Enterprise. When Cancer Runs in Your Family, Should You Get Tested? Although a strong family history of cancer can raise alarms about your own possible risk of developing cancer, only about 5% to 10% of cancers are linked to inherited mutations, and most people diagnosed with cancer don’t have a family history of the disease. That said, there are definitely some inherited factors that can increase your risk of developing cancer, such as the BRCA1 and BRCA2 mutations linked to breast and ovarian cancer. If you have a strong family history, what can you do to better understand and face any additional risk you may have? If you think you have an increased risk of developing cancer based on your family history, ask your doctor for advice on finding a genetic counselor, or get more information from the National Society of Genetic Counselors at aboutgeneticcounselors.com. Sonequa Martin-Green, actor, May 2018. Sharon Bober, PhD, senior psychologist, Dana-Farber Cancer Institute. Banu Arun, MD, co-medical director, Clinical Cancer Genetics; professor, Breast Medical Oncology and Clinical Cancer Prevention, M.D. Anderson Cancer Center. American Cancer Society: "How Family History Really Affects Your Cancer Risk."